There were three (.5) specific weather conditions that aligned correctly in order for this scene to be revealed. 1) Low tide (had to be timed where the lowest point of the cycle was during the nighttime shoot. 2) No Moon. The moon would certainly be able to offer its own dynamic light to the scene, but I was here to shoot stars! 3) Clear skies and horizon. Important when you’re standing at sea level and trying to photograph the heavens. 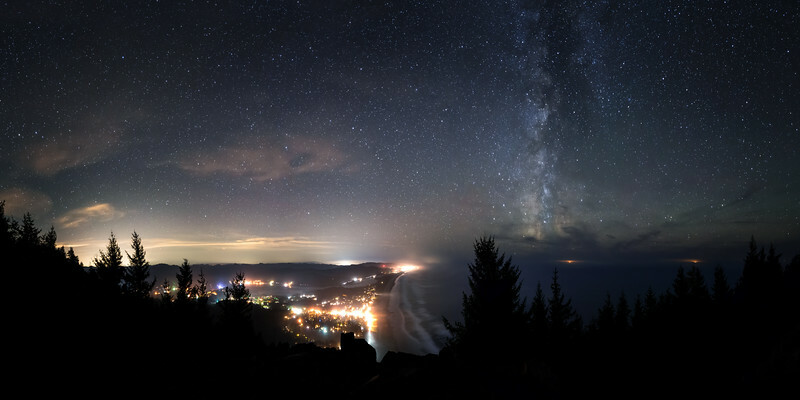 Any amount of fog or marine layer out there would have blocked the almost perfect milky way touchdown on the water. 3.5) Fall season. Our dusty core will shoot perpendicular out of the South West / West horizon this time of year (Oct 14th in this case). 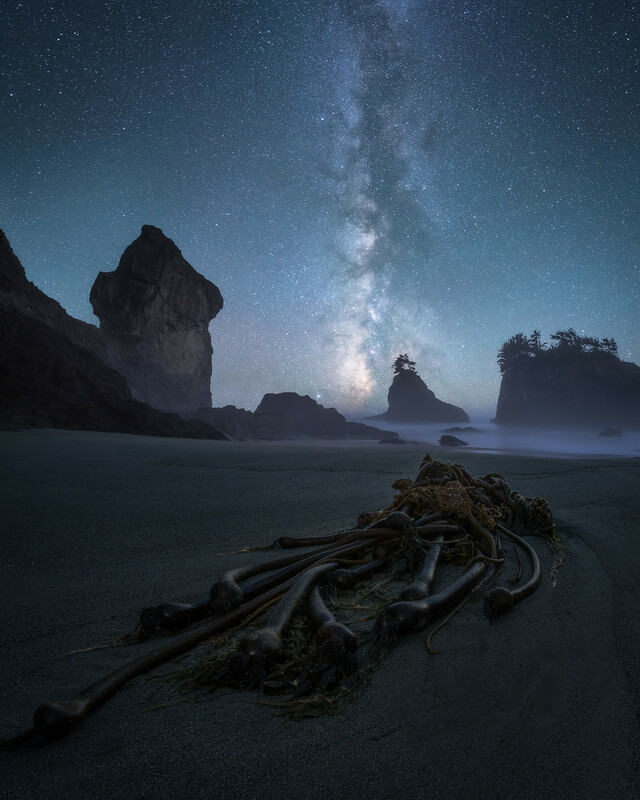 With all of these in mind, I started my two night “rush” coastal photography shoot up in Northern Oregon near Astoria, and Manzanita city. This was a solo trip as Henry was tied to his work as a lifeguard during these couple of days. The first night was spent on the summit of Neahkahnie Mtn. where this scene revealed itself under the cover of dark. 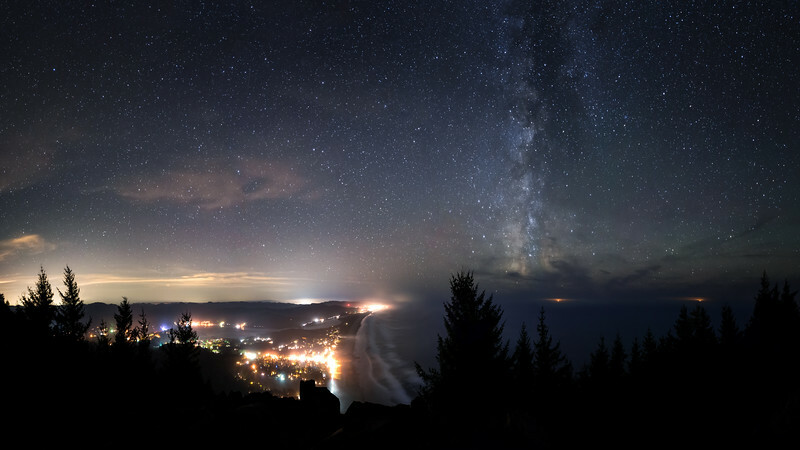 ~15 images were combined to make this ultra wide HD panoramic of Manzanita City under our galaxy. The lights above the ocean are oil tankers very far away! Sunset from earlier that evening on Neahkahnie summit. Those rocks weren't pleasant to sleep on! Day two started with a quick jaunt down from the summit, back to the truck, and then an all day drive south towards the California border near S.H. Boardman State Park. I found a pullout for the truck along the 1 hwy, and made my way down to the beach to beach to start scouting for the impending nighttime. The small bay I wanted/ had planned to shoot during this low tide evening had a beautiful piece of kelp washed up on the sand that ended up being a great centerpiece for the photograph. After waiting through sunset, and all the stages of twilight, the stars finally revealed their presence over the horizon and photography mode was go. The kelp was composed using a vertical panoramic technique and is a series of 4 images each with a different focal points and then all manually blended together using Photoshop masks (this process is loosely called “perspective blending”). After the kelp was shot, I simply continued to pan the camera up into the sky and stars while taking pictures about every 30 degrees or so. 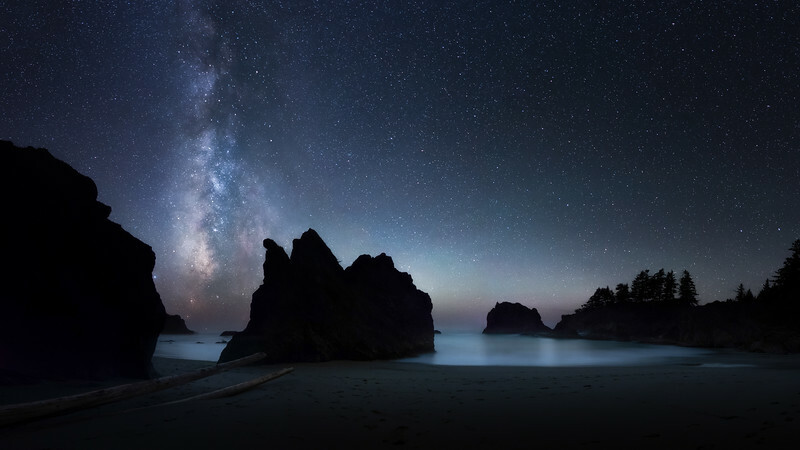 Cosmic Cove. Another view of the same beach that night with unfortunate footprints in the sand from a group of guys running around at sunset. Gear used for these shots: Nikon D810, 14-24mm wide angle lens, a sturdy tripod. Why do I shoot panoramas even though my lens has a huge natural field of view? Dynamic Range (HDR = High Dynamic Range). The more information you can bring into post process, the more options you have for your photographs during the final edits. I didn’t include the exposure and camera settings as I feel they would be irrelevant. I take a good amount of test exposures to dial in which specific settings to use for the evening. Every shoot is usually different depending on light and what you’re trying to walk away from the shoot with. Basic night settings always include: High ISO, Open up the aperture ring as wide as it will go (ex. f/2.8 on a good amount of lenses), a relatively long shutter speed 15” seconds +. Not all cameras are created equal when it comes to quality when shooting at these demands, but there are always techniques to give yourself the most dynamic range with what you’ve got.